6. Generally, no delivery. Pick up is from Damansara Heights (ANYTIME BETWEEN 9.30am-9pm DAILY), or Bangsar Baru, which is my office, in Telawi Area, Mon- Fri 9.30-5pm (OFFICE HOURS). Unless specified, pick up is assumed to be from Damansara Heights. Hobbyist Baker, Retired Civil Engineer, Realtor by Day, Baker, Husband & Dad By Night. Essentially, a Sticky Date Pudding, where I have reduced the sugar dramatically but I find is still sufficiently sweet. 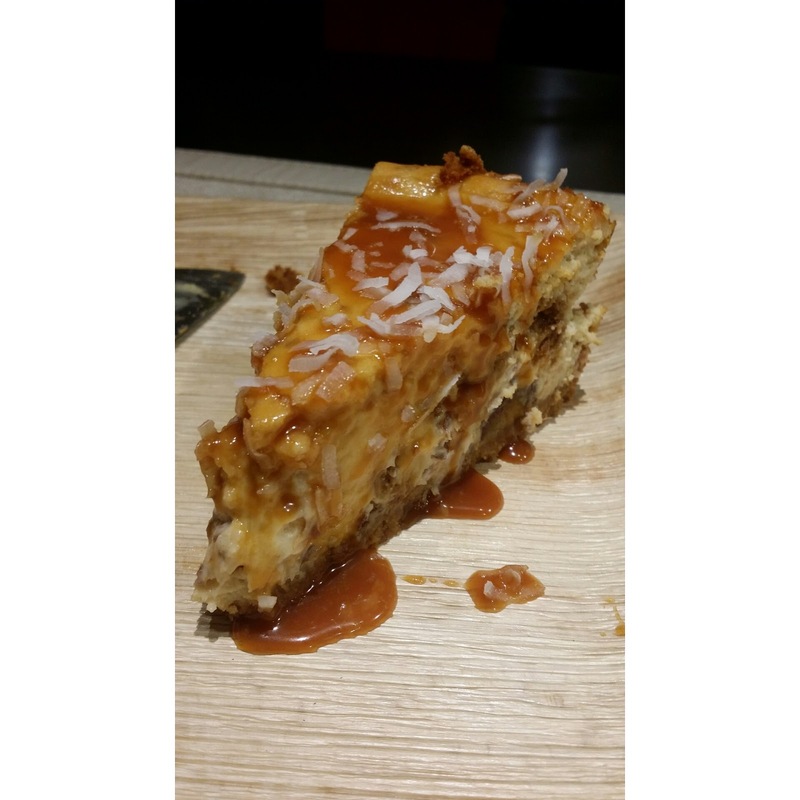 The salty caramel is separately drizzled on top of the cake and is ordered separately. I've always LOVED mint (though people are as divided over mint as they are with durian, some people think it reminds them of toothpaste). This is a back to basics chocolate cake with chocolatey minty chocolate cream layers, smeared and topped with ganache. Orangey chocolate, with the slight hint of bitterness from the rind, which exudes that lovely orange oil, chocolate chips, covered with chocolate ganache. 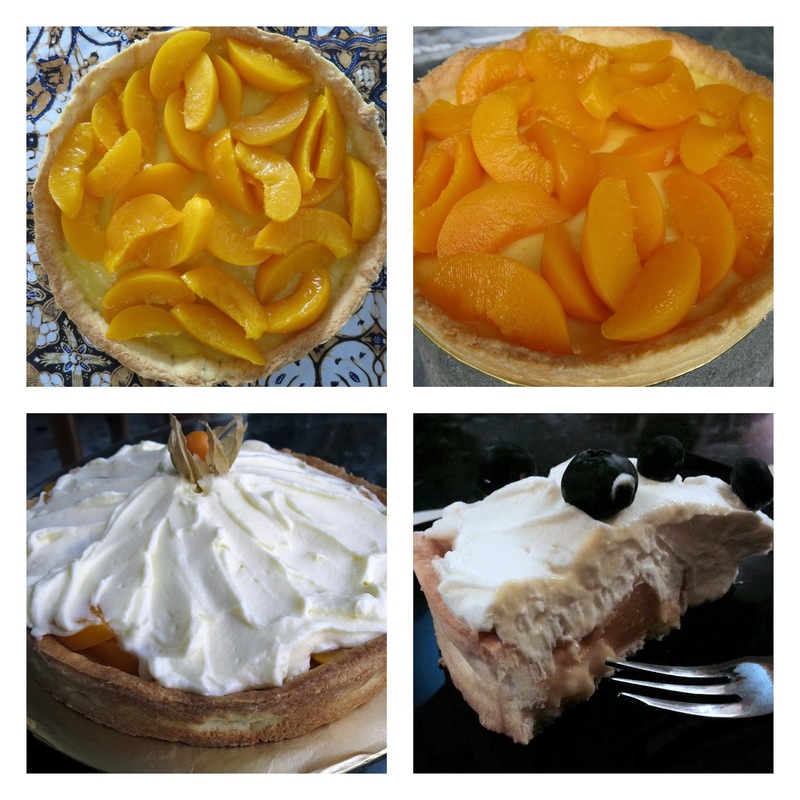 A bed of tangy lemon curd in an 8" shortcrust tart shell, with sweet canned peaches topped with rich mascarpone cream. 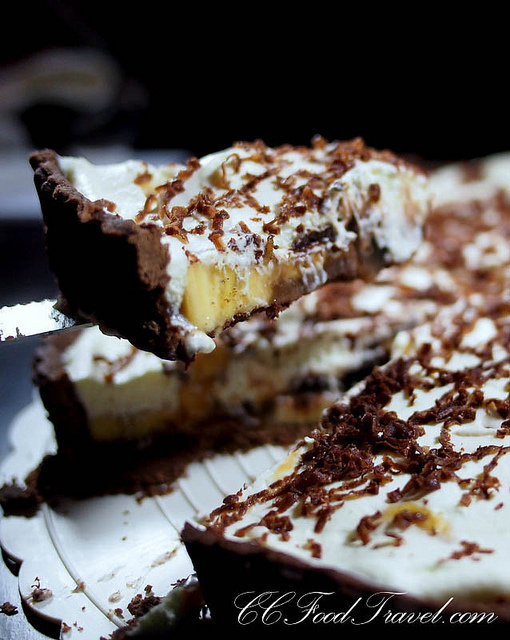 A Baked cheesecake. Named after friend of the same name, ...A little bit nutty, a little bit cheesey, a little bit salty (ham sap), a little bit sweet. But overall damn solid. Contains macadamias, salty caramel, and chocolate chip. approximately 1.3kg of cheesy nuttiness. 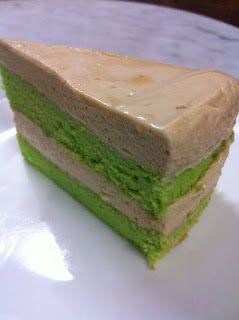 Named in honor of "Thamby" (you know who you are), this cake is a Pandan Sponge With Layers of Gula Melaka Flavoured Cream Cheese. Pandan and Gula Melaka are a match made in heaven, just like in a cendol. RM80. Named after a good friend, A Lil Fat Monkey who designed the Fatboybakes logo, this very rich cheese cake comprises Caramelized Bananas, Peanut Butter, in a combination that would please any monkey, or human, who loves the aforementioned ingredients. RM80 for baked, RM75 for chilled. Mac Tart for short. A school of macadamias drowned in sea of thick caramel, encased in a chocolate tart shell, covered with a layer of dark chocolate ganache. 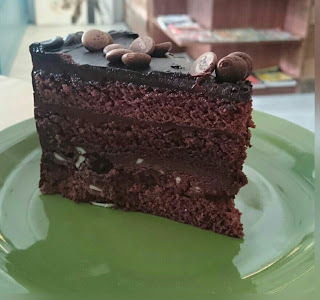 A messy chocolate cake with layers of salty caramel and ganache. It's hard to make caramel sit still, much like a petulant child, so be warned, it oozes out of every pore. It's a heavy cake, about 1.3kg at least. 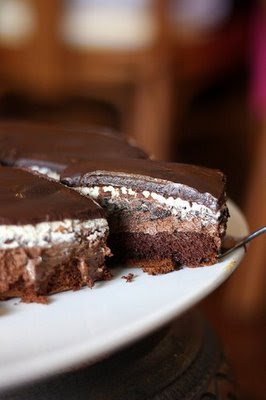 Note: The cake is totally covered with ganache so as to avoid the caramel from spilling out. Picture is before the cake is totally covered. AROMA THERAPY, thus named cos of the therapeutic smell emanating from the King of Fruits, if you are a durian lover. Layers of sponge sandwiching layers of durian cream made from real pulp, lightened with some fresh dairy whipping cream. Let the aroma of the king of fruits assail your senses. 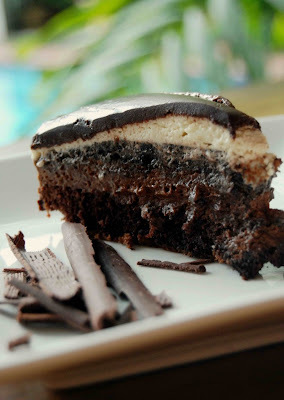 An oreo base, with a layer of peanut butter "mousse", topped with bananas, a layer of fresh cream, cake, another thin layer of cream, and chocolate ganache. A great combination of sweet and slight saltiness but not for the "allergic to nuts" people. Spencer 4 Seasons because of the four different layers, or 4 seasons for short, has endured for nearly 10 years as one of the most popular chocolate based cakes. The first cake to be named after a dear friend, Spencer comes in Virgin form and Boozey form. 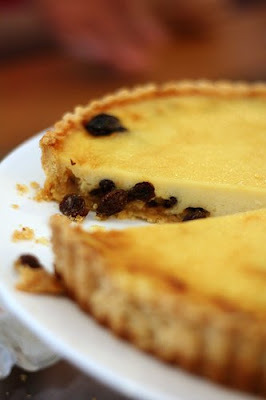 Inspired by one of my favourite ice cream flavours, I figured you can't possibly go wrong with a Rum & Raisin Cheesecake. 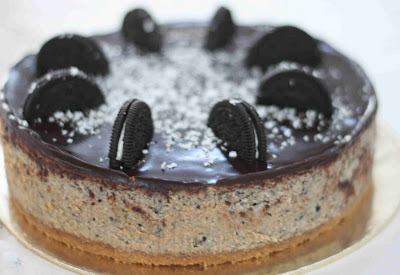 The picture shows the baked version, but is also available as a chilled cheese cake. An enduring classic, that despite it's retro-ness, is one of the all time best sellers. A generous portion of canned cherries, enveloped in chocolate sponge, doused with cherry syrup and/or alcohol. For the cherry die hards, a double portion (effectively two cans) of cherries can be requested. RM85 for Boozey Blackforest, RM80 for Virgin Blackforest. Add RM10 for double cherries. Chilled Durian cheesecake, a best seller by far. Obviously you would need to be a fan of the King of Fruits to be able to appreciate it, so non-durian fans, stay away. The aroma is likely to linger in your car as well, so if going long distance, it might be a challenge. Why "Dad's"? Well, it's always Mum's this and Mum's that when it comes to food right?! Oh, my mum's chocolate cake, or my mum's carrot cake.....WELL, it's high time DAD'S GOT THEIR RECOGNITION!!! Hence, DAD'S BAKED MARS BAR CAKE. 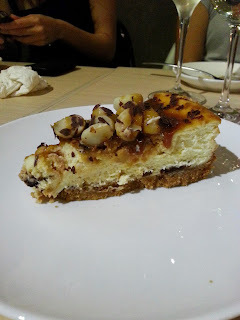 A rich baked cheese cake, with Mars Bars incorporated into the cake. The savouriness of the cheese combats the usual sickly sweetness of the Mars Bar, giving it a perfect blend of salty, sweet, chocolatey, all in one mouthful. The dessert named after the famous Russian ballerina, Anna Pavlova, presumably cos of the white wafty meringue. Usually sickly sweet, but I have tried my best to reduce the sugar while maintaining the integrity of the meringue. Fruit size varies of course, according to season. Standard Pavlova, unless otherwise stated, comprise strawberries and blueberries. RM80. For plain strawberry, RM75. Other additional fruits available on request and if available. Cost quoted accordingly. 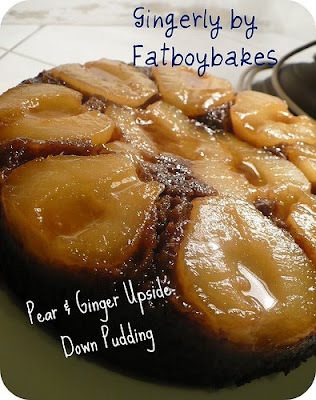 The sweetness of canned pears plus the heat of the ginger in this pudding like cake, honestly, is not everyone's cup of tea. But I love it, served with plain Vanilla ice cream. 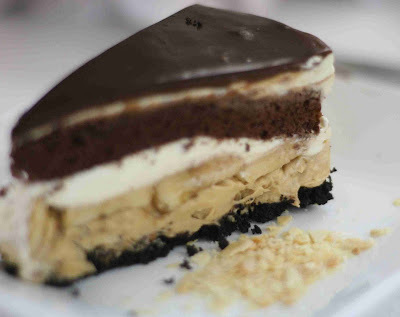 The universally popular Tiramisu Torte, with caramelised nuts enveloping layers of mascarporne sandwiched between a coffee sponge, soaked in coffee, and alcohol. Of course a non alcoholic version is optional. No raw eggs. RM90 with brandy, RM85 without. 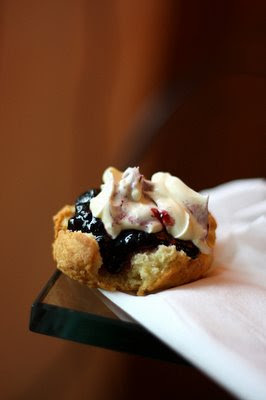 A fairly light but buttery scone, that goes perfectly with a dollop of clotted cream and good jam. As cream and jam are very personal, I do not supply both items. RM50 for batch of 16. 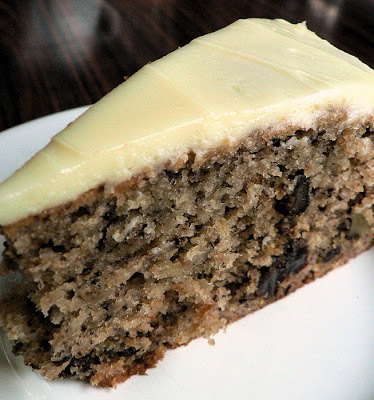 A recipe taught to me by my "godma", this wonderful combination of banana, walnuts and raisins is topped with cream cheese frosting. A gluten free cake made from eggs and chocolate, like eating a huge chocolate truffle. Non alcoholic version available. QUICHE - Various fillings, can opt for chicken, beef bacon, mushroom tuna, spinach etc etc. Average cost about RM 75-RM80. 9" diameter, filled with Granny Smith apples stewed in Cinnamon, with a buttery shortcrust pastry. 9" diameter tart shell filled with Granny Smiths stewed in Cinnamon, topped with a buttery crumble with oats and pumpkin seeds. 8" diameter in a disposable aluminium pie dish, generous serving of chicken and mushrooms.